Chef Nadeem Khadem Al Jamie, a Syrian refugee, works in the kitchen of the Hotel d'Angleterre for the Refugee Food Festival, Oct. 11, 2017. The Swiss city of Geneva was a good place to be for food lovers earlier this month. Foodies enjoyed the tastes and smells of food from around the world at a Refugee Food Festival. The event gave refugees from five countries a chance to demonstrate their cooking skills. Local restaurants turned over their cooking spaces to chefs from Syria, Eritrea, Sri Lanka, Tibet and Nigeria. 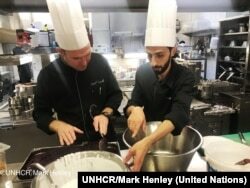 One of the refugee chefs was 29-year-old Nadeem Khadem Al Jamie from Syria. He says cooking is a driving force in his life. He told VOA he learned how to cook from his uncle. Nadeem Khadem Al Jamie worked in his family’s restaurant in Damascus before he was forced to leave Syria in 2015. He said that he traveled from Syria to Turkey, and then to Greece. From Greece, he walked all the way to Germany, and then to the Swiss border. His wife and two daughters eventually joined him through a family reunification program. He hopes his involvement with the Refugee Food Festival will lead to a job. Louis Martin is one of the founders of Food Sweet Food, a non-governmental organization. It started the Refugee Food Festival in 2016 in partnership with the United Nations’ refugee agency. Martin told VOA the festival has two main goals. Martin said he became concerned after the arrival of thousands of refugees to Europe in the summer of 2015. He said their images led him and his Food Sweet Food partner, Marine Mandrila, to create the festival. Louis Martin and Marine Mandrila brought their idea to the UN refugee agency in Paris. Celine Schmitt works for the UN High Commissioner for Refugees. She told VOA she immediately liked their idea. “Food is a great way to create connections. It is also a great way to change the way people see refugees because if someone eats well, he will maybe have another idea, perspective afterwards. But, also, it’s a way to integrate refugees." Chef of the Hotel d’Angleterre, Michael Coquelle, left, and Chef Nadeem Khadem Al Jamie, who is also a Syrian refugee, work together in the hotel's kitchen for the Refugee Food Festival, Oct. 11, 2017. The festival offered food for people with different tastes and from different walks of life. Nadeem Khadem Al Jamie’s five-course Syrian meal cost about $90 at one of Geneva’s luxury hotels. People with less money to spend enjoyed tasty Nigerian or Ethiopian food at two other restaurants. Each of those meals cost about $20. Schmitt said one great part of the festival was the teamwork between the restaurant’s usual chef and the refugee chef. Lisa Schlein reported this story for VOANews.com. Jonathan Evans adapted her report for Learning English. George Grow was the editor.